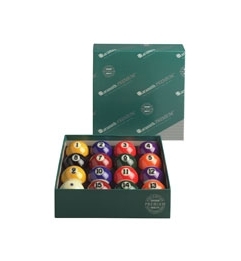 Aramith Premium Belgian Pool Ball Set with 2-1/4” Cue Ball. Genuine Belgian Cast Phenolic Resin. Numbers Are Precision Engraved in a Solid Core That Runs All The Way Through The Ball. Burn Spot Resistant - Engineered to Be Wear Resistant, Making Aramith Balls Far Less Vulnerable to Abrasive Burn Spots. Aramith Phenolic Pool Balls Can Withstand 50 Times More Impacts Than Polymer or Polyester Pool Balls. They Are Also Twice as Scratch Resistant. Number in the Stripe - 9-15 Balls. Large Numbers. Weight, Hardness, & Roundness all Meets International Billiards Standards. Worldwide Endorsement - Aramith Phenolic Balls are Used by Most Professional Tours, Federations, and Amateur Leagues. Precision Calibration of Each Ball for Maximum Consistency Within the Set.